Plans for or famous 4.5 meter diameter geodesic dome greenhouse, as featured on BBC2 it''s not easy being green. The plans also include the 4.8m version as this is the size of kit I normally make. These plans show everything you need to know to build one really cool greenhouse. You will need some accurate wood machining facilities and a few basic woodworking tools to build this kit. 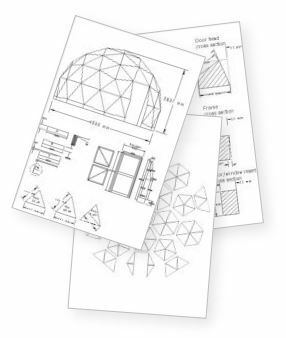 Construction details and building tips are included to help make your dome building project run smoothly. 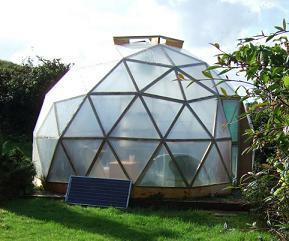 It should cost around £350 in materials and about two weeks to build this dome. You will need some accurate wood machining tools but unlike other dome structures you only have to cut one angle on all the frame timber, this makes it much easier to put together. You will also have to make some patterns so all the triangle frames are the same. 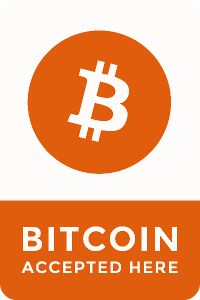 Other than that it's a fairly straightforward DIY project. Visit my youtube channel for dome building video tutorials, showing how to cut the timber, make patterns and cover the framework: Click here to go to Paul's youtube channel.